This year, The Brown Bookshelf would like to introduce a new profile — the “Up and Comer.” In this space, we recognize a children’s book creator “who has made a significant contribution to the world of children books before publication.” We’re delighted to welcome educator, activist, and author Jackie Wellington as our first Up-and-Comer honoree, and as you’ll see below, significant doesn’t even begin to describe it. How did your teaching lead to your writing of fiction? I am a writer who was raised in a Jamaican family. If you know anything about the culture, you’d know education is important and writing is not a “worshipped” profession. Doctors, Lawyers, teachers are notable aspirations for a child growing up on a small Caribbean island. Chef, writer, and artist, not so much. So I did what was expected. I graduated high school, joined the Army, and attended college. For years I taught. Math was my specialty, but I was great in reading and language arts. I worked with students with disabilities. Most of them, if not all, were reluctant readers. Bribing them to pick up a book was my secret weapon. My students never had books. So whatever skill I taught, I wrote stories to supplement the curriculum. Then I had an idea. One day, I watched my students in the cafeteria. They were loud as usual, trying to figure out who did what. Who was responsible for something? Eavesdropping, I already solved the problem, but they were still baffled. At that moment, I decided they would be the characters in a lesson on logical reasoning. I wrote a story, each of them had a role to play. I had to allow their persona to shine. My class clown had to be the funny one which was difficult for someone like me to write since I do not consider myself a humorist. They had to work together to solve the problem. It was a hit! They all wanted to be the star of the story. So I created my own curriculum and integrated stories in Math, Language Arts, and Social Studies. Then one of my student said, “Miss, you are good at this…you should write books!” That was years ago. Why and where did you see the need? There is a need for diverse books – picture books, middle grade, and young adult. I would like to see more children being represented in picture books. There are many animal characters. Children need to see themselves early on as they embark on the journey of reading. I have to admit, I never paid attention to the characters until I taught. In Jamaica, we got books from America and England. When I was seven, I read every Nancy Drew, Hardy Boys, and Bobbsey Twins. While Nancy was traveling to Arizona to solve mysteries on a ranch, I was going to the beach, sipping coconut water, and eating Jerk Chicken from the side of the road. The fact that Nancy did not look like me did not bother me at all. But in America, your race enable people to form opinions about you. On my island, race is second nature. We are Jamaicans, a mixture of people from all over the world. What was the response from your students? My students like to see themselves in books. Whether they are solving mysteries, jumping through obstacles, or slaying dragons, each of them want to be the victor. The hero. The problem solver. The adventurer. Tell us a bit about the #ReadSameReadDifferent campaign. The purpose of #ReadSameReadDiffernt campaign is to expose readers to the creativity of underrepresented authors in the Kidlit industry. This is not about Blacks, Whites, Latinas/Latinos, Asians, Native Americans, or any other ethnic groups. This is about books. Children. Reading. And exposing. One goal – to get great books into the hands of children of all races, cultures, and socio-economic groups. This is embracing #DIVERSITY and #MULTICULTURALISM. This campaign is not complex. I love it because it gives me the opportunity to do what I love – READ BOOKS! I read a lot of books and then I pair them with books written by diverse authors. For instance, one of the books I loved last year was A DANCE LIKE STARLIGHT written by Kristy Dempsey and illustrated by Floyd Cooper. This book is a picture book about a little girl who dreams of becoming a ballerina. I can take this book and pair it with MY FRIEND MAYA LOVES TO DANCE by Cheryl Willis Hudson or MOON OVER STAR by Dianna Hutts Aston. I can take HARRY POTTER and pair it with HOW LAMAR’S BAD PRANK WON A BUBBA-SIZED TROPHY. People say, “Those books don’t go together.” I beg to differ. They are related in many ways beneath the surface. So my job is to convince others why these books are wonderful pairings. I am loving reading new books.By the way, it is time to update the list. I hope this campaign will enable the industry to extinguish the myth that Black folks don’t read. Books are ways to escape. And everyone deserve the opportunity to escape into a world far from his own. A world where mysteries need to be evaluated, adventures need to be explored, and fantasies need to be encountered. Tell us about your journey to publication so far. I am new in the writing game. I have been taking some writing classes, honing my craft. I am paired with some awesome mentors. I did find an agent. I have some stories in revision mode. I guess I am at the point where I am paying my dues, but I have time. I’ve only been writing for one year. So I have time. What stories do you most want to tell? I most want to tell stories that expose readers to unknown African-American heroes. The heroes you do not read about in history books. Heroes such as Walter Morris, the first African-American paratrooper in the Army who forced the Army to integrate. Or Valaida Snow, the musical prodigy who was captured and placed in a Concentration Camp. And what about Mary Ellen Pleasant who went from living in slave shack in the south to a millionaire mansion. Children need to know why these people risk their lives for the betterment of their race. I also want to write stories and correct history. Correct what we have been taught. I want people to know that the Civil Rights Movement went all the way back to the 1800s. And that the “Mother of the Civil Rights” is not Rosa Parks. These are the stories I want to tell. What are your goals for your writing career? What are some things that you hope to see happen in the industry? I want to see a more diverse industry. I want to see the inclusion and representation of all children. And I want to see them in a positive light. What do you wish editors and publishers knew? I wish editors and publishers knew what diversity looks like. If you do not sit and mingle with people who do not look like you, then how do you know what our characters are supposed to do and say? Jackie, you are the hardest working writer I know! Perseverance and great writing have connected with you my friend. Congratulations on beginning your dream! And I absolutely love the sketch of you. I bet I know what Vespa-driving illustrator drew it! Well done! 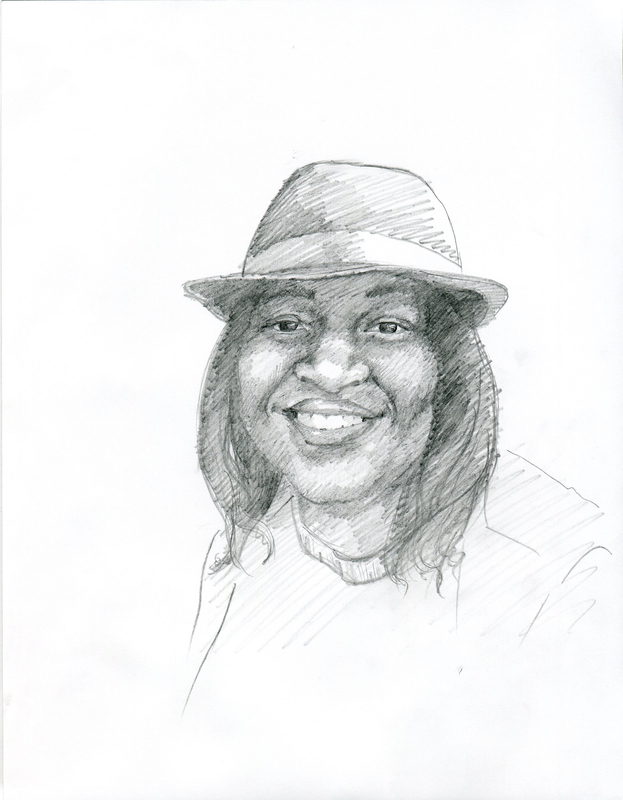 Thanks, Angie 😀 The sketch is by Lori-Ann Levy Holm…I love her work…And she loved me. And thanks for the compliment. Wonderful interview! I learned a lot about you, Jackie! And you made a great point in your last statement. Wow, you’ve only been writing for 1 year and have already snagged an agent. Your students were lucky to have you adapt the curriculum just for them. Congrats for being on this blog! Jackie, I’m so very excited to learn more about you. I’ve “met” you in some online classes and find you to be infinitely helpful AND enthusiastic about everyone’s stories and WIPs. What a creative way to work with your young and reluctant students! I’d like to talk to you more about that. I’m honored to know you! What a wonderful interview Jackie! You have so much to offer the writing (and reading) community. I look forward to seeing more of your work! Great interview! I wish and pray for a huge, successful career! Fabulous work Jackie! Thank you. Enabling kids to see themselves in the books they pick up is a key ingredient in encouraging them to pick up more of them. You’ve accomplished so much towards this end…and I know you have a stellar career in writing ahead of you! Jackie, I did not know how the writing started for you, but it makes sense…you are such fun to work w/personally and dramatic. I can just see your students joy when you wrote them into stories and had them act. Great likeness form Lori Ann, too. Congrats writer/activist/friend. I know you are gonna break out big. Reblogged this on Why I Write Picture Books? (#YIWritePB). I know the writing classes are for your writing, but I’m glad they were a chance for me to meet you! Keep living the life. Yes, I took Susannah’s Making Picture Book Magic, Kristen’s Nonfiction Archaeology, and Mira’s Chapter Book Alchemy. And it is great knowing you, too. Such an excellent article! Wonderful to learn more about your journey Jackie! Can’t wait to see your books in print! Jackie, you are a powerhouse and you have begun a journey which will change things for all children. You have seen the weakness and you are doing something about it. You will see the the inclusion and representation of all children in upcoming books. I’m delighted to count you as a friend and I will be there to watch the future change. Congratulations, my friend. Charlotte, you are too kind. Some thought-provoking information here, Jackie. It’s so interesting to hear about your journey to writing. I like knowing you even better than I did before…best of luck in all of your adventures! Looking forward to seeing you again in July! Excellent points, Jackie. Good luck with with everything. Woohoo, Jackie! Great interview! I am in awe of your story-telling talent. You’re on the track to greatness, and I’m here in the cheering section, standing up, waving that huge sign with your name on it! Thanks, Marcie…The world will be equally blessed when they hold a copy of your book in their hands. You are an awesome critique partner. Thanks for embarking on this journey with me. I’m a believer too!! Way to go Jackie!! Happy to know you when. Thanks, Mira…I learned a lot from your Chapter Book Alchemy Course…thanks for giving me a chance. Activist, teacher, soon-to-be-writer. I’d put money on there being more this story, this time next year. Good luck, and blessings on the journey! Thanks…and there is indeed more to this story…blessings. This is great, Jackie. You have so many stories to tell, so much to share. You are amazing, Jackie! Young readers are so lucky to have you as an advocate. I really enjoyed learning about your journey and the causes you are involved in. Looking forward to having Jackie Wellington books on my shelves, very soon! Great interview. Glad you were included in this series. That’s wonderful how you wrote stories for your students. I’m also looking forward to having one of your books on my shelf. Thanks, Stacy. I appreciate your support. I am so proud of you. The journey you shared gave us such a rich insight into how you have become such a force in the kidlit community. The ReadSame ReadDifferent project is such a phenomenal and important campaign. I am so glad this is going so well. I just have to say that the love and support in these comments is absolutely wonderful, and a testament to the blessing your work has already been, Jackie. Congratulations, and keep shining! Thanks, so much Olugbemisola. I am honored and humbled. I want to thank the Brown Bookshelf for this opportunity. I love my kidlit community. They are so kind, loving, and supporting. Be blessed! Jackie, I am thrilled to read this interview… I know the depth of your commitment to children’s literature and admire it’s solid roots.Your voice will rise up! Kudos for spreading your KidLit joy everywhere… I feel blessed to share in your journey. Thanks, Jodell. Thanks in believing in me and giving me the opportunity. I look forward to selling many books with you. I am loving you, Agent-friend.